A carnelian agate with several beautiful eyes from Botswana, Africa. This specimen is about 3/4? in length. The image below is a close-up of the large eye. 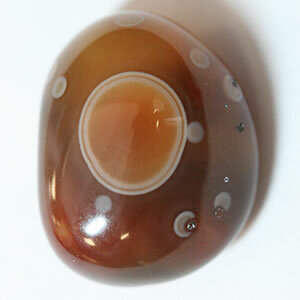 An eye agate is an agate that exhibits one or more round concentric markings known as "eyes." The photo at right is a piece of carnelian agate from Botswana that has several beautiful eyes. As a general statement, eye agates are rare. However, some localities are well known for producing eye agates. 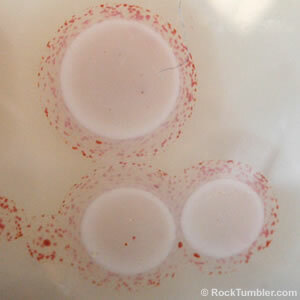 Carnelian, gray and pink agate nodules from Botswana, a small country in southern Africa, often contain eyes. Lake Superior agates found in the Great Lakes area of the United States frequently contain numerous colorful eyes. People are fascinated with eye agates. They marvel that nature could produce such perfect circles. Eye agates are often selected for use in jewelry, carried as pocket stones, placed in a collection or very carefully cut into cabochons. Many people believe that an agate with an eye is a special stone of value that should be treasured. 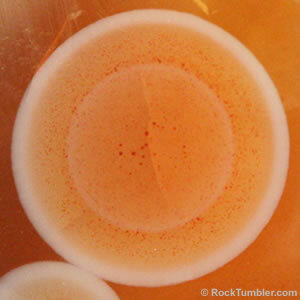 This photo is a close-up of the large eye in the carnelian agate shown above. You can clearly see its concentric pattern. How Do Eye Agates Form? Eye agates are most commonly found in agate nodules. These nodules usually form when silica precipitates within a rock cavity. This cavity can be a bubble in a lava flow, a fracture in rock layer or a fossil that has dissolved away. Shortly after an initial layer of silica is deposited on the walls of the cavity, round droplets of silica gel form on the walls and begin to crystallize. In these droplets, a tiny "seed" crystallizes first and additional layers of silica form around it. 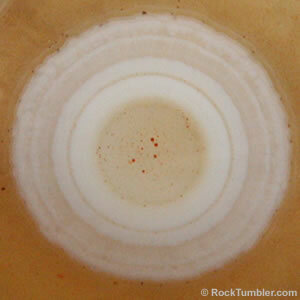 It grows larger with each layer of silica, forming the concentric pattern of the eye. This origin on the inside walls of a cavity explains why eyes are most commonly found in the outer "husk" of an agate nodule. A rootbeer-colored agate from the Lake Superior region with a large eye and multiple small ones. A nodule of pink Botswana agate with a white husk and several pink eyes. See the photo below for close-ups of a few eyes. 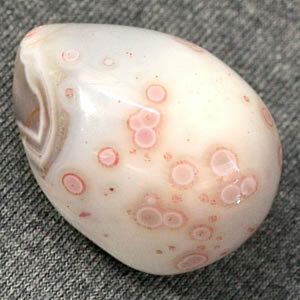 A Botswana agate nodule with numerous pink eyes on its husk. 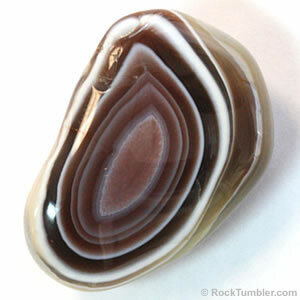 When you observe an "eye" on the surface of an agate, keep in mind that it also extends into the interior of the agate. In three dimensions it has a hemispherical shape. You are viewing the flat side. Remember that the seed crystal forms on the wall of the cavity and layer after layer of silica forms over it. This creates a small growing dome on the wall of the cavity that is hemispherical in shape. Some people call eye agates "hemi agates" because of their hemispherical shape in three dimensions. Close-up view of an eye showing many concentric layers of agate. When you view an eye like this you are actually looking at the bottom of the eye. Each of these concentric bands forms a thin hemisphere of material into the stone. These two eyes began forming side by side with independent concentric layers. As they grew they touched one another but the concentric layers kept growing, incorporating both eyes into a single complex silica growth. From this side they have an outline like a number "8." In three dimensions they would look like two merging hemispheres. Although some people would call this an "eye agate" because it has concentric bands, the proper name is a fortification agate. It formed as described in the paragraph above. 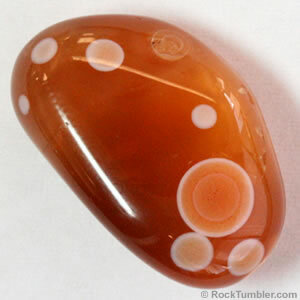 Some people confuse fortification agate with eye agate. The photo at right is a fortification agate. It formed when layers were added to the walls of a cavity. As each concentric layer was added, the cavity became a little smaller. Eventually the entire cavity was filled. 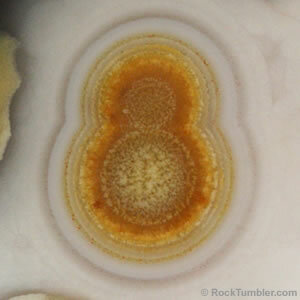 Although fortification agates are banded and have a concentric pattern, they are not eye agates. "Eyes" are a small part of an agate nodule; they form within the "husk" of a nodule and they crystallize from the inside outwards rather than from the outside in.